Chris Kirk is a performance artist who doesn’t always know when the performance is going to begin or where the line is drawn between “performance” and “being myself”. He has performed around fires and on stages and currently accepts all invitations. 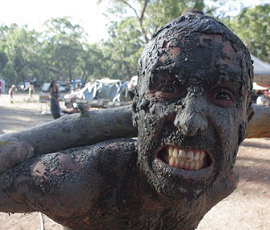 His performance experience includes poetry, theatre, musical theatre, Shakespeare, improvisation, short film, song, dance and Mud Tribe (as pictured). He has a Bachelor of Performing and Screen Arts. He has been living without money for four months, eating out of dumpsters, hitchhiking and sleeping in caves or on the beach, and is now attempting to infiltrate television performance to facilitate further air travel. He writes regular stories, essays and prose poems for his website, www.personaproductions.com, and likes it when people leave comments. He is a filmmaker and was nominated for a Media Peace award in 2005.